... only to be inexplicably and unceremoniously dropped starting in the Q2 2017 quarter. So we decided to recreate the chart using data JPM disclosed in its earnings supplement. What we found may explain why JPM "forgot" and keeps "forgetting" to add that particular slide. 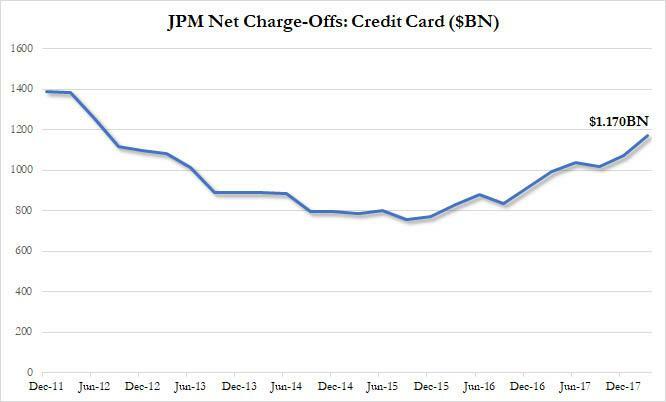 It shows that after bottoming in late 2015, JPM's net credit card chargeoffs have been steadily rising, passing $1 billion as of Q2 2017, and as of Q1 2018 were at $1.17BN, back to levels last seen in June 2012 or nearly 6 years ago, suggesting that contrary to Jamie Dimon's commentary, the US consumer is not doing all that hot after all. JPM's overall charge-offs climbed by $100 million to $1.3 billion in the quarter, driven entirely by this increase in souring credit card loans, which jumped 18% Y/Y from $993MM to $1.170BN. As a result, the charge-off rate in card rose to 3.32%. As Bloomberg notes, the bank had said the charge-off rate for the year in cards would be 2.95%, so analysts might have some questions about whether that target will need to come up based on these numbers. 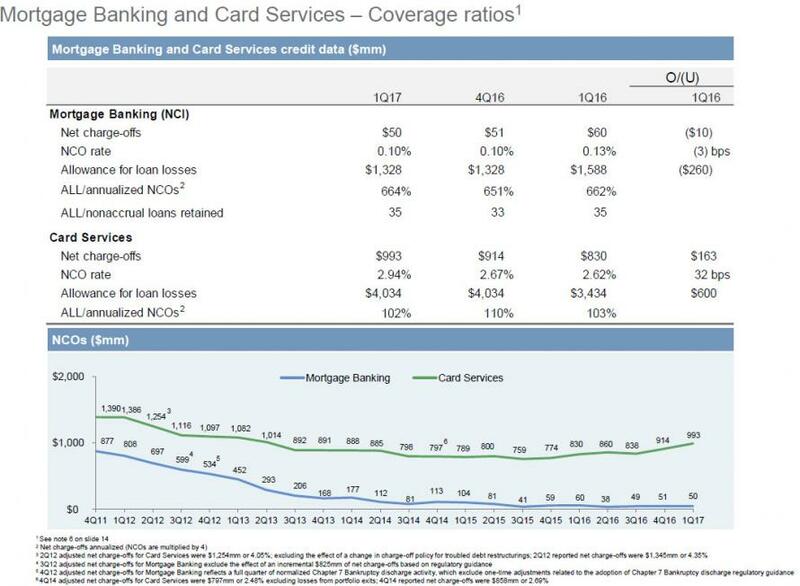 As a reminder, in his Q1 commentary while Jamie Dimon was quick to note that "business sentiment remains upbeat, and consumers benefit from job and wage growth" with just a short, cryptic note on this troubling credit card trend: "The consumer provision reflected higher net charge-offs in Card in the current quarter, in line with expectations." Why is this notable? Because as we discussed recently, using the S&P/Experian Bandcard Default Index, "Credit Card defaults has surged the most since the financial crisis" and looking at the JPM numbers, while there has been a modest improvement, the trend underscores that the key driver of the US economy is starting to get increasingly more stretched.